At one point in time, I seriously thought I was going to get some grills—you know, put gold caps and jewelerize my teeth like the rappers. 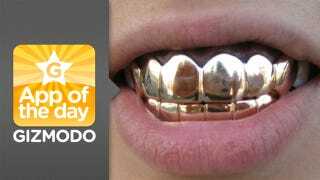 Luckily, I didn't have to spend the money because this Grillz app for iPhone makes me feel like I already have them. It's an app that mimics your talking with a mouth on the iPhone screen. Sounds stupid? Hardly. This mouth is infinitely cooler than yours because its decked out in gold, platinum and diamond grills. That's right, you hold the iPhone up to your mouth, speak and the app will start moving the lips on the screen, flashing your new grills casually. It's like all the benefits of having grills with none of the pitfalls (cost, hygiene, bacteria). Cause it's silly fun! There's 4 different grills to choose from! And it tries its heart out to be accurate: when you scream, the mouth opens up wider so you can see a full monty view of the grills. When you talk regularly, it'll move the mouth at a similar rate. Either way, you're going to swag out a lot harder than what you were doing with your pearly whites (probably hello yellows). Also, the two developers, Jasper Speicher and Nicolas Torres, made it an emphasis that however gag-like their app was, it was going to be authentic—real grills were going to be used. Torres actually went to various grills shops in the San Francisco area and asked if he could take pictures of true grill wearers. A few accepted and he snapped about 15-20 different shots of each grill and those shots make up the pictures you see in the app.